CALLAHEAD is renowned for providing the highest quality equipment and service to our clients, as well as offering the largest selection of superior accessory items. Our mission statement, "To Develop and Evolve a Human Necessity," means assuring that our customer's portable sanitation equipment is the most up to date available, beyond all others. Presenting the HEADMIST, CALLAHEAD's odor control system is a first for the portable sanitation industry and an essential odor control product for any public restroom. The HEADMIST is designed to keep your restroom smelling clean and fresh, eliminating unpleasant odors from previous users, and assuring that every visit to a CALLAHEAD portable toilette is a pleasant one. The HEADMIST, installed in your portable restroom, will automatically release a fresh scent to dissolve any unpleasant odors for every user, and will forever change the outlook of using a portable toilette. The HEADMIST system is enclosed in a durable plastic casing with an attractive white and gray design, complete with CALLAHEAD's signature navy blue signage. Even otherwise skeptical users of portable toilettes will use a CALLAHEAD portable toilette, due to the HEADMIST's clean fresh scent. Because the HEADMIST system is 100% maintained by CALLAHEAD, you will always be confident of a fresh smelling unit. A HEADMIST on your job site or special event will make for happier employees and guests because your restroom facilities are not only clean, but smell clean. A restroom, either public or private, is one of the hardest places to remove odors, no matter how clean and sanitary, due to odors of previous users. Automatic odor control systems have been used in top hotels, restaurants and other public restrooms across the country, to eliminate intolerable odors for years, and CALLAHEAD is excited to be the first company to offer this system to the portable sanitation industry. Covering up to 6,000 square feet of space, you are assured that the HEADMIST can handle the job, for the best smelling portable toilette available. CALLAHEAD is constantly out in the field gaining knowledge from our clients on what they expect and deserve from their portable restroom experience. We understand that the top concerns are sanitation, cleanliness, and odor control when using a public restroom, and CALLAHEAD is the only company in our field to address all of them. When your job site or special event requires portable sanitation equipment, there is only one company that can offer the highest quality equipment, service and accessories -- CALLAHEAD. Eliminates unpleasant odors for every user to ensure of a fresh smelling visit to a portable restroom. • Promotes use of portable toilettes by otherwise skeptical users. • A HEADMIST on your job site will be appreciated by your employees making for a happier employee and a better worker. • Clean and fresh smelling restroom facilities will make any special event a better event for you and your guests. • HEADMISTs are 100% maintained by CALLAHEAD, with absolutely no labor on your part. • Bad odors in restrooms can give a negative impression. Having a HEADMIST will assure that your portable restroom will give your employees and guests a good impression of you and show them that you care. Public restrooms are used much more frequently than one in your home, which is why odors lingering from previous users cannot be avoided...Unless you have a HEADMIST installed in your portable toilette. • Your employees and guests can be embarrassed or self conscience to use a public restroom in fear of causing odor for the next visitor. The HEADMIST will eliminate their embarrassment. • NO ONE LIKES A BAD SMELLING RESTROOM... PERIOD! Mounted inside unit. • Various fragrances available. • Scent sprays automatically on 15 minute intervals. • Coverage area is up to 6,000 square feet. • Available for daily, weekly or monthly rental. • Maintained 100% by CALLAHEAD. 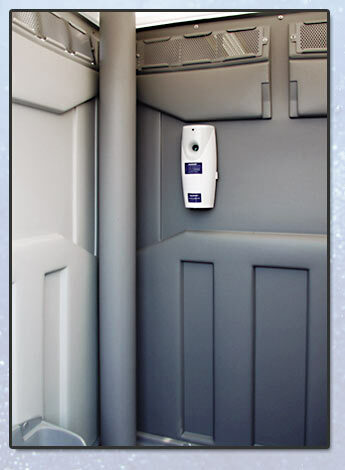 The HeadMist Odor Control System for Porta Potty/Portable Toilets.